TEHRAN, May 17 (MNA) – Leader of Islamic Revolution Ayatollah Khamenei highlighted the significance of preparing for a peaceful and secure election while the rest of the Middle East region is gripped with insecurity and conflict. Ahead of presidential and city council elections in Iran scheduled for Friday May 19, hundreds of people from all walks of life met with Leader of Islamic Revolution Ayatollah Ali Khamenei on Wednesday in Tehran. 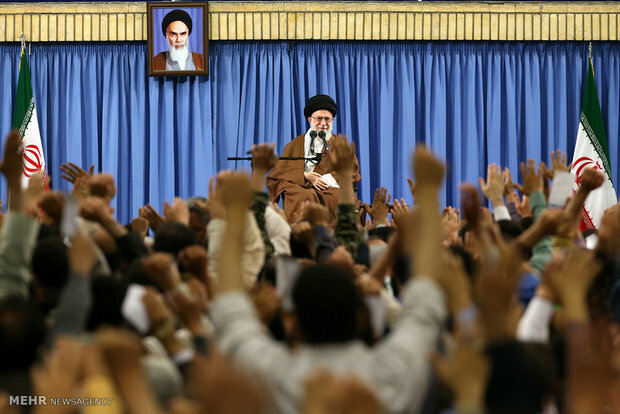 “Elections are going to be held in two days in a country with an 80-million population where the nation is getting ready for a passionate and enthusiastic turnout, but peace is preserved everywhere,” Ayatollah Khamenei said, while highlighting the significance of this peaceful atmosphere in an otherwise turbulent region. “The Iranian nation has learned how much this order and discipline benefits them and how non-compliance with law and order will be harmful to them,” he stressed. Freedom, effectiveness of people’s vote, and the current secure and peaceful atmosphere in Iran are indebted to the Islamic Republic Establishment, he stressed. “The regional nations whose governments are dominated by the US can only dream about having a competitive and free presidential election like the one we have in Iran,” he said. Ayatollah Khamenei concluded that progress will continue and the Islamic Republic will see the day when its enemies have despaired at their plots and stopped their nonsensical remarks against Iran.